Ambleside, Lake District National Park, Cumbria, England - Desirable, peaceful location, a few minutes level walk to central Ambleside. We have tried to make Bracken Howe the best possible Lake District experience for larger groups - more like staying at a friend's country residence than hiring a holiday let. Bracken Howe is a five-bedroom property of genuine quality and elegance. Modern, but with many of the original elegant Victorian features retained and restored. High ceilings and large rooms reinforce the feeling of spaciousness. The quality of the property and the facilities on offer were independently assessed by ‘Visit England’ in April 2017 and Bracken Howe was awarded its highest Five Star Gold rating. Bracken Howe was built in the early 1880s, constructed of local stone and green slate. The house had been owned from new by the family of Miss Thompson, former headmistress of the local school. Some of the original features were bought with the house e.g. the service bells in the kitchen, the roll-top bureau in the dining room and the clover leaf occasional table. The original single-glazed windows are a feature of the house as are the geometric Victorian tiled floors and striking pitch-pine staircase. The house is centrally located at the end of a private cul-de-sac off a quiet one-way residential street close to the centre of the village of Ambleside. In the words of one guest, Bracken Howe is an “…amazing home, in an ideal location…”. In the garden at the rear of the property you can sit on the balcony (or in the hot tub) enjoying a panoramic view of the mountains or alternatively, within a few minutes walk, you can be in the centre of Ambleside, with all it has to offer. We strongly recommend that guests take advantage of the wonderful location of the property. Ambleside is one of the region’s most popular towns, with so much to offer and set right at the heart of central Lake District, boarding the north shores of Lake Windermere. Ambleside’s activities include boats (large and small) on Windermere, England’s largest lake, including for example a steamer trip, or there is rowing, canoeing, sailing and motorboats on the lake. For other activities in the town there are: tennis courts, miniature golf, local bike hire, climbing, walking, cycling and water sports. There are also organised tours and regular buses to explore the surrounding areas. For a rainy day, a few minutes’ walk from the property is Zefferelli's multi-screen cinema to take in a movie, which could perhaps be followed by a meal at their own well regarded vegetarian restaurant. On selected evenings you can also listen to a Jazz band at Zefferelli's while having a drink or a meal. The Ambleside Climbing Wall and Bouldering Cave is a 5 minute walk away and the Cafe Altitude is a great place to watch the action or enjoy the skyline of the surrounding fells. It's no secret that the Lake District has some of the best places to eat, from Michelin standard food to simple dishes that showcase the region's top local produce. For dining and drinking, there are plenty of pubs, restaurants and cafes within a few hundred metres of the property. If you would prefer a take-away meal back at Bracken Howe there is choice of Chinese, Thai, Indian and English food within a few minutes’ walk. 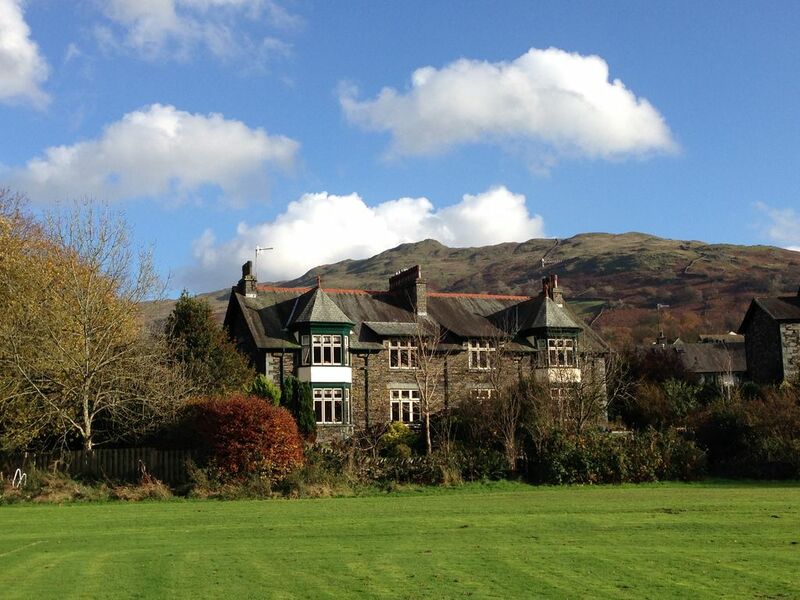 There are many nearby walks around Ambleside, directly from the front door of Bracken Howe. This includes the Fairfield Horseshoe which is visible from the garden and is a one of the great high-level Lake District walks while Loughrigg Fell, directly behind the house, is a wonderful medium level hike. An even more straightforward walk, directly from the property and taking in two lakes, is along the western bank of Rydal Water then along the shores of Grasmere and back along the eastern shores of both lakes taking in the history of Wordsworth at Dove Cottage and Rydal Mount, before returning to Bracken Howe. With all these walks, along the way, you will find great places for eating and drinking. In short, much of your holiday could be spent in and around Ambleside, without using your car. If you do want to use the car, however, it will be much rewarded as about twenty minutes’ drive takes you: west to Coniston Water; north to Keswick; south to Hawkshead; or east to Ullswater. Even closer are: Langdale Valley (west); Grasmere (north); and Bowness-on-Windermere (south), which are all about ten minutes’ drive from Ambleside. Janet and Phil have four children and live in Southport. Janet worked as a primary school teacher, but is now a full time Mum, and Phil is a university professor so we do not have as much time to spend at the property as we would like, but we hope to retire there some day. Meanwhile, we try to stay occasionally, but also share it with guests and provide the best possible experience for them in the hope they will want to return and tell their friends. The Lake District has been close to our hearts since climbing, walking and cycling there in our late teens. It is not just the natural scenery of mountains and lakes that attracted us, but the local culture generated by the villages, pubs and the local people. We were particularly looking for a property in the heart of the Lake District national park, rather than on the fringes where we would have needed to ‘travel in’ each day. Ambleside lies at the centre of the Lake District national park and borders the north shores of Lake Windermere. It is one of the region’s most popular towns with so much to offer for eating, drinking, entertainment, as well as leisure and sporting activities. Most of the main Lake District towns and lakes are only about 10 to 20 minutes’ drive from Ambleside. We fell in love with Bracken House on our first visit. It is a large, elegant Victorian house built in 1880 with the feel and features of a bygone era, but with modern facilities and décor. It has a character that is hard to describe, but easy to experience. A four-poster bed and a hot tub typify the past and present in harmony. Indeed, sitting in the lit-up hot tub on a winter’s night with a (plastic) glass of champagne, was one of our best experiences in the property. Ideally, we wanted a property where we could walk out the door to start some classic Lake District walks (short and long), but also to be close to local facilities to eat and drink without using the car. We did not expect to tick all of these boxes but Bracken Howe does that – and more. Ensuite Bathrooms to Bedrooms 1, 2 & 3 all with either shower enclosure or bath with shower over, basin & WC. Master Bathroom with roll top free standing bath, separate shower cubicle, basin, WC & underfloor heating. Downstairs WC with underfloor heating. Luxury white towels and slippers provided. Range of Orla Kiely toiletries provided. One toilet roll is left in each bathroom ready for your arrival. Luxury white bedding with pillow menu. The property is cleaned prior to arrival with all beds made up. Summer house or cellar available for storage of large items e.g. kayaks, bikes upon request. Luxury towels and slippers provided. Tea towels provided. Large sitting room with panoramic views. 3 Multiyork sofas (installed February 2016) comfortably accommodate 10 people. Window seats. Open fire & fire guard. 55" 3D Curved 4K TV with surround sound, Blu-ray player, full Sky & BT HD sport package. Large AGA dual fuel range cooker with double oven, grill, plate warmer, 6 ring gas burner and griddle (installed April 2015). Separate slow cooker. There is a cupboard set aside containing useful consumables for guests to use e.g. salt & pepper, herbs, vinegar, flour, castor sugar, tin foil, cling film. The contents of this cupboard do vary. Villeroy and Boch cutlery. Two dinner sets - Denby Praline, John Lewis Queensbury Hunt. Variety of Dartington crystal glasses and everyday range. Plastic glasses available for use in the hot tub. The kitchen is well equipped to cater for large parties having a range of utensils and cooking accessories e.g. food processor, blender, cake tins, range of cookery books, Raymond Blanc pans etc. Tea towels, kitchen roll, oven gloves and apron provided. There is a large oak table that comfortably seats 12 people. The dining room opens out at one end into the kitchen and the other out onto a balcony outside. 2 high chairs available upon request. The property has a comprehensive Sky Package including Sky Sports and BT Sport HD. The dining room has a Naim mu-so music system with Bluetooth, WI-fi and Internet radio. Bedrooms are equipped with clock radios some of which have Bluetooth. The lounge has a Bose system. The lounge, snug and four bedrooms are equipped with blu-ray players. In the dining room you will find a wide range of reading material including maps. The Snug contains a 40 inch TV, games consoles and a full size Yamaha electric keyboard with stand. The sideboard in the dining room contains a wide selection of board games, jigsaws and Lego. In the dining room you will find a wide range of board games, toys and DVDs. Available through i-pod and mobile phone devices and via the internet and bluetooth. Board games and LEGO. The Snug is equipped with a large Yamaha keyboard and games consoles. There is an extensive DVD collection in the dining room. The Sky package includes a wealth a channels including films. Sky can be watched in the bedrooms. The snug has a Nintendo Wii, Xbox 360, Kinnect and a Playstation 3. Controllers for games consoles and a range of games for all ages are provided. The garden is grassed and has views across Rothay Park to Loughrigg Fell & the Fairfield Horseshoe. There are outdoor seating areas in the corner of the garden, by the hot tub and on a raised deck leading to the dining room. Kayak/canoe hire and tuition is available locally at numerous locations around Lake Windermere and Coniston within a 10-20 minute drive from the house. Bicycles are available for rental locally (within a 5 minute walk). Secure bike storage is available at the property with prior notice. Rowing boat, dinghy hire and charted boats available to hire at numerous locations around Lake Windermere. Waterhead is a mile away from the property. Low Wood a short drive from the house or a few steps on the bus offers a range of watersports equipment for hire. Well kept public tennis courts available less than a 10 minute walk away. Equipment is available to hire in Platts Park. Cumbria isn't exactly filled with golf courses, but what it doesn't have in numbers it most certainly makes up for in quality, variety and value for money. The nearest course is Windermere Golf Club, which is approximately 5 miles away. Other notable courses further afield are at Brampton, Kendal, Silloth, Ulverston, Keswick, Carus Green, Penrith and Kirby Lonsdale. The property has a detailed access statement that can be provided upon request. Bracken Howe is not suitable for wheelchair users as there are steps at both entrances and there is no downstairs shower room. There is a hot tub in the garden that comfortably fits 6 adults. The hot tub is available throughout the year and is not recommended for children under the age of 12 years. Bracken Howe is a much loved home, and our family lives here for part of the year. We would be grateful if guests would bear in mind the following: Bracken Howe is strictly a no smoking property. Sorry no pets or large hen or stag parties please! Bracken Howe provides self catering accommodation and you are, therefore, requested to leave the property clean and tidy when you depart. A video tour of the house is available via the internet. Please contact the owners to request the link. Price includes gas, electric, Wifi, towels. In addition, a housekeeping bond of £300 is required. This will be returned assuming the house is left in a satisfactory condition. Midweek breaks (Monday 4pm - Friday 10am) and long weekends (Friday 4pm-Monday 10am) are available at certain times of year. At peak times, only full weeks are available but we will try to be flexible. Normal changeover for weekly breaks is a Friday. For Christmas and New year weekly breaks the changeover days usually move to Wednesday. Booking notes: Please check the Owners Direct website to confirm availability. If you require any further information or would like to make a booking please email or call Phil or Janet. House & location couldn't have been better! The house was perfect for our group of 4 couples who spent a week in Ambleside, visiting the Lake District. The location of the house is ideal in terms of walking to shops, restaurants, etc, and Ambleside is a great town from which to visit other Lake District towns nearby. The house was beautiful, comfortable and well equipped. Janet & Phil were very helpful with prompt replies to our questions both leading up to and during our stay. A beautiful property in a fantastic location. Fantastic touches. The welcome hamper was the best we have ever received in similar properties. Oral kierly toiletries a touch of luxury. The hot tub was so relaxing after a long walk. A fantastic house for a group of family and friends. Great location and fantastic service throughout! The 10 of us were unable to find anything to fault with this wonderful property. The size and comfort was incredible, the décor and cleanliness immaculate, the provision of Sky+ HD, gaming consoles and broadband very comprehensive, not to mention the hot tub with fell views! And all this within a 5 minute walk of all the Ambleside services. We stayed at Bracken Howe for my Mum's 70th birthday celebrations (six adults and 4 children, aged between 11 and 13). The information provided prior to our stay and reviews etc proved to very accurate although Bracken Howe exceeded our expectations. The convenient location meant we did not need the car all weekend and took advantage of nearby walks. We watched the Christmas lights switch on and the lantern parade but watched the fireworks from the comfort of Bracken Howe where we had a perfect view. The house was full of character, immaculate and beautifully furnished to a very high standard, with a very well equipped kitchen. The owners have gone to a lot of trouble of to create a welcoming atmosphere with thoughtful touches throughout. We would highly reccommend a stay here - a perfect place to recharge your batteries. Thanks Phil and Janet, we'd love to come back! Bracken Howe is an ideal base for walking, with walks available from the doorstep. A different walk could be taken every day for over a week without even getting into the car. Walks nearby include easy routes to Grasmere and Rydal Water, or more challenging routes on Fairfield. Walks to Loughrigg and Lily Tarn are amongst the owners favourites. The route to Skelwith Bridge past the 'old golf course' and down to Clappersgate give fantastic views of the Langdales and Lake Windermere. These walks are not taxing but routes along the ridge to Pavey Arc and return along the valley are more testing. Bus services will take walkers up Greater Langdale from where they can walk back! Bracken Howe is popular with cyclists and bike storage is available upon request. Bike hire, and repairs available 200m away in Ambleside. Bracken Howe is 1km from Waterhead on Lake Windermere. (A shuttle bus runs throughout the day from Ambleside for the less mobile.) There are cruises on the Lake to Wray Castle, Far Sawrey, Bowness, Brockhole and Lakeside at the south side of the lake. From Waterhead, you can hire a boat, feed the ducks or enjoy a meal or a drink overlooking the lake. For that special occasion you may wish to hire a skippered yacht. Ambleside's Platt's park, a few minutes walk away, has a children's playground and next to the church there are tennis courts, crazy golf, bowling and a pitch and putt course. Rothay Park's recreation ground is a few minutes walk and this provides an excellent children's play area, football pitch and picnic areas beside the river. A car is recommended but not essential as there is good access to all bus services in Ambleside. Local frequent bus services available. In the dining room you will find a wide range of reading material including maps. In addition, guests are welcome to watch any of DVDs and play with any of our games and toys. The Snug is equipped with a large Yamaha keyboard and games consoles including X-box, X-box Kinnect, Wii, and Playstation. The property has a comprehensive Sky Package including Sky Sports and BT Sports HD. There is a health/leisure club with swimming pool and Spa at the Salutation Hotel in the centre of Ambleside. Nearest public swimming pool can be found at Troutbeck Bridge, Windermere or Kendal Leisure Centre. Nearest Theatres/cinema - Ambleside has a cinema located in 3 different buildings in the village (100-150m walk away) Old Laundry Theatre, Bowness (15 minutes by car) Brewery Arts Centre, Kendal (30 minutes by car). Theatre by the Lake, Keswick (35 minutes by car). Stocking up is easy at Booths supermarket (Keswick/Windermere) but a five minute walk away you will find a Tesco Express, Co-op and Spar both of which have extended opening. The local butchers and artisan bakers are also excellent. There are many super restaurants to suit all tastes within walking distance - from fine dining to Fish & Chips! Ambleside also has a range of bakeries, art galleries, book shops and coffee shops (many of which serve hearty breakfast!) There is also a tourist information centre and it goes without saying, lots of walking and gift shops! Booking Notes: Please check the Owners Direct website to confirm availability. Changeover Day: Normal changeover day for weekly breaks is a Friday. For Christmas and New Year weekly breaks the changeover day moves to a Wednesday. Arrival from 4pm. Please depart by 10am on day of departure. Notes on prices: Price includes gas, electric, Wifi, towels. In addition to the above prices, a housekeeping bond of £300 is required. This will be returned assuming the house is left in a satisfactory condition. Midweek breaks (Monday 4pm-Friday 10am) and long weekends (Friday 4pm-Monday 10am) are available at certain times of year. At peak times, only full weeks are available but we will try to be flexible. Please note that the property does not accept dogs.